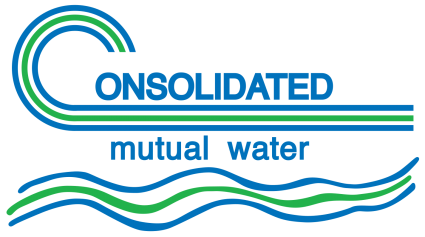 The Consolidated Mutual Water Company (Consolidated) stores, treats, and delivers safe, clean water, reliably and economically to our Stockholders/customers. Our treated water meets or exceeds all clean water standards as mandated in the Federal Safe Drinking Water Act and standards set by the Colorado Department of Public Health & Environment. Consolidated’s service area spans nearly 27 square miles, serving an estimated population of 100,000 people in Lakewood, Wheat Ridge, Applewood and Pleasant View. We have over 400 miles of pipelines, four water storage reservoirs, several potable water storage tanks, numerous pump stations and other infrastructure components necessary to deliver water to your property. As a private, mutually owned non-profit company, Consolidated does not make a profit or receive tax dollars. We reinvest your money from rates and charges to maintain and upgrade our water treatment and delivery system. Most importantly, Consolidated is debt free and has a significant financial reserve for water purchases and infrastructure enhancements. The strong financial position Consolidated enjoys is because of outstanding financial stewardship and leadership from the Board of Directors. For your information, you, our Stockholders/customers, elect Consolidated’s Board of Directors. The Board makes visionary and strategic decisions that ensure Consolidated can meet demands of providing clean, safe drinking water into perpetuity. The Board’s strategic decisions protect and support the value of your investment in your property. Current activities: We have implemented a significant pipeline maintenance and replacement initiative. This initiative is an on-going annual project that replaces pipelines initially installed in the 1930s through the 1960s. We will expend between $3 million to $5 million on this critical infrastructure project. Plus, we are implementing two extensive, multi-year construction projects. The first project is a major ‘retrofit and upgrade’ to our Water Treatment Facility. The upgrade is to our sludge handling de-watering process, and this upgrade will save more water – our most precious and scarce resource – during the treatment process. The second major project is a Maple Grove Reservoir spillway improvement. We start the design phase in early 2019, with construction beginning in December 2019. This improvement will protect our dam, and release water slowly into the spillway during long-lasting heavy rain weather events -remember the fall of 2013? Accordingly, each year Consolidated conducts a cost of service analysis and tracks the expenses of the total cost of services to provide water to you, our Stockholders/customers. In balancing all the necessary construction projects, pipeline maintenance and replacements, rising costs associated with inflation, and purchasing and storing raw water, our value of service analysis indicates a water usage charge of $5.00 per 1,000 gallons – with no ‘tiering’ structure – and a monthly service fee of $21.25 per ¾” meter, or $17.50 per 5/8″ meter. (Monthly service fee will vary by size of the meter.) Please note that the monthly service fee remained unchanged for the preceding eight years. The average Consolidated residential customer will experience less than a $4 per month increase in their water bill.